Listen to a podcast of Eric on WCHL 97.9FM in Chapel Hill, NC. Eric discusses the importance of having a land survey before you buy a home. What you need to know before buying a lot or house. So, you have found the perfect house. Congratulations. Finding a house that is right for your family is many times a long and frustrating process. Finding the right overall layout with the desired number of bedrooms and amenities can take time. Other factors to be considered are the school district for the kids and the distance to and from school or work. Once the Offer-to-Purchase is accepted by the seller, the buyer should order a home inspection by a licensed home inspector. Your real estate agent more than likely has a few home inspectors that they are familiar with and can recommend. The home inspector has the knowledge and expertise to evaluate all of the important components of a house. Occasionally a home inspector will recommend that a licensed Professional Engineer evaluate drainage issues or cracked foundations to determine whether there is a serious problem or if the cracks are merely superficial. While a home inspector evaluates the home itself, who is qualified to evaluate the land that the house sits on? This book will identify important things that every buyer should evaluate or hire a licensed Professional Engineer and/or licensed Professional Land Surveyor to evaluate before closing. Your perfect house may be on a lot that is encumbered with many features which may restrict use or cause maintenance problems in the future. 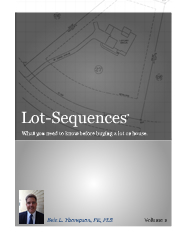 This book will give you the guidance and confidence you need to make sure that your perfect house is on a building lot that will provide years of worry free enjoyment. This book will be updated as necessary, as environmental and governmental laws and regulations are continuously becoming more stringent. This book is available now at Amazon.com.